ohhh my goodness. Deliciousness overload! I am definately going to try a few of these. Thank you! I am drooling just looking at all these pictures! Thanks for sharing! Yum, it all looks so good! Caramel apple french toast?!!?! are you KIDDING?! That looks scrumptious!!! All so yummy! That caramel apple french toast looks amazing! Love apple crisp. I put cheese on mine. Oh my goodness!! I think I just gained 10lbs looking at all of those fabulous desserts! I'm so glad you stopped by my site and I am your newest follower! i LOVE LOVE fall foods! and love your blog...so very cute! The apple butter pound cake sounds DELICIOUS right now! oh. my. goodness. 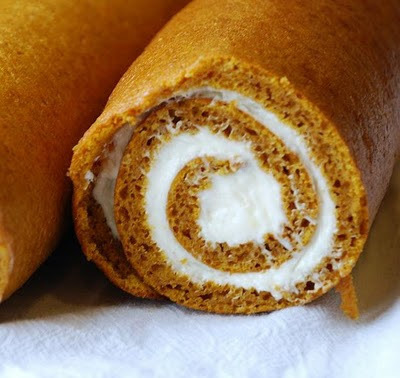 that pumpkin roll looks incredible!! You're making me hungry! So very hungry! Yum those look delicious! I want that pumpkin roll!! man i am suddenly hungry thanks to your post. overnight caramel apple french toast, yes please!! and that pumpkin roll looks so yummy! Thanks Erica, will follow you as well! I really don't even know where to begin with this post....I love everything!!! OMG I want all of those. Awww, I love all of these!! They make me think of fall & feel like fall - despite the 88 degree weather I have right now! omg that french toast looks So good! Caramel apple french toast sounds amazing! All of these pumpkin treats have me drooling! I love, love, love pumpkin whoopie pies! Gah, it's only 9:20 in the morning where I am and I desperately want to make and eat all of these! wow, so many delicious recipes to choose from. I just made apple crisp the other week and it was so good! I may need to make those pumpkin whoopie pies now! The overnight french toast would be a perfect weekend treat!! Oh my gosh, all of that looks amazing!! So many good looking goodies! That all looks GREAT. I could live off baked goods only. Mmmmm - I LOVE pumpkin! My favorite recipe is a pumpkin crunch cake (so easy!) or just combining a box of yellow cake mix and a can of pumpkin for some quick muffins.